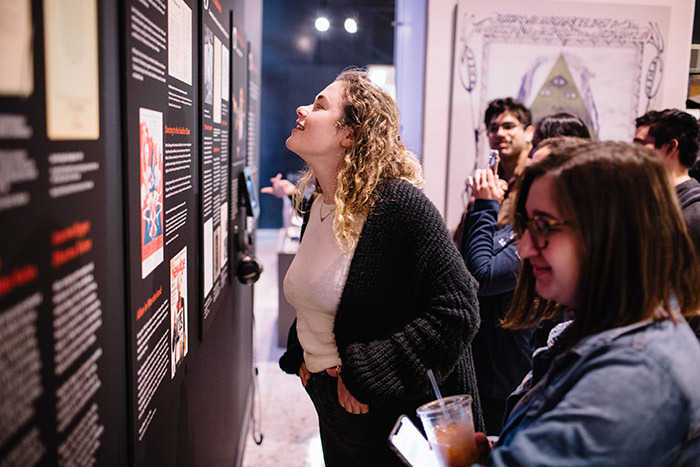 A major exhibit on Beat generation writers now includes material curated by undergraduate students, an example of the hands-on research made possible by Emory’s Stuart A. Rose Manuscript, Archives and Rare Book Library. 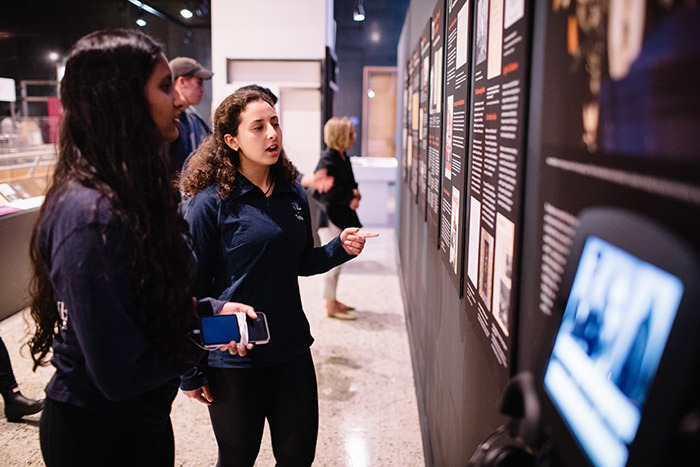 The Rose Library provides inspiration and learning for Emory’s students and instructors, as well as objects and artifacts for exhibitions on campus. 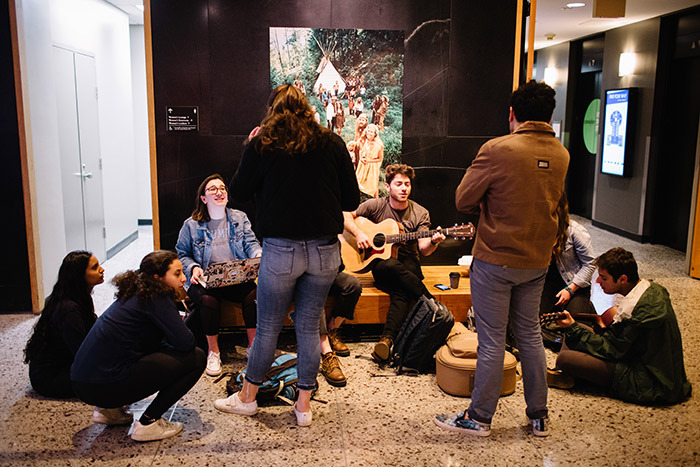 During this past spring semester, the archives were integral to a religion class, “Modern Buddhism: Beat Poets and the American Counterculture,” taught by Tara N. Doyle and Sara McClintock. 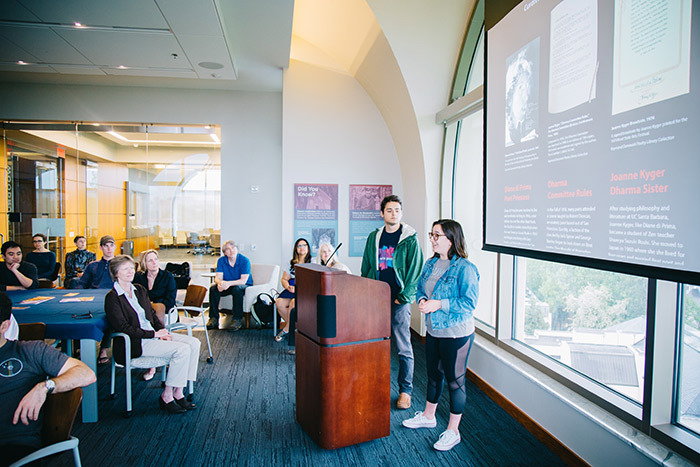 Their students used the archives of the Rose Library for the course’s centerpiece assignment — a pop-up exhibition of six posters highlighting prominent members of the Beat literary movement and how their art and lives were influenced by Buddhism. These posters were integrated into the main exhibition, “The Dream Machine: The Beat Generation & the Counterculture, 1940–1975,” at the Robert Woodruff Library, which can be seen in the Schatten Gallery through Sunday, June 17. 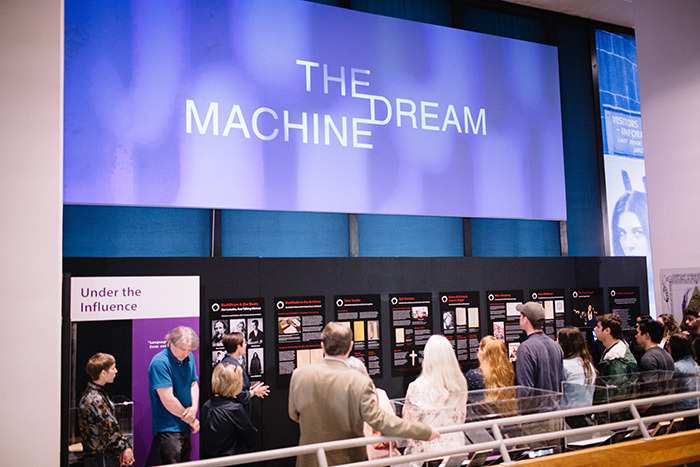 While “The Dream Machine” focuses on influential members of the postwar social and literary Beat movement and their writings, the class project added another dimension to the exhibition by using the Rose Library materials to explore these countercultural writers’ relationship to Buddhism, with the students discovering more rare artifacts in the archives as they researched this connection. 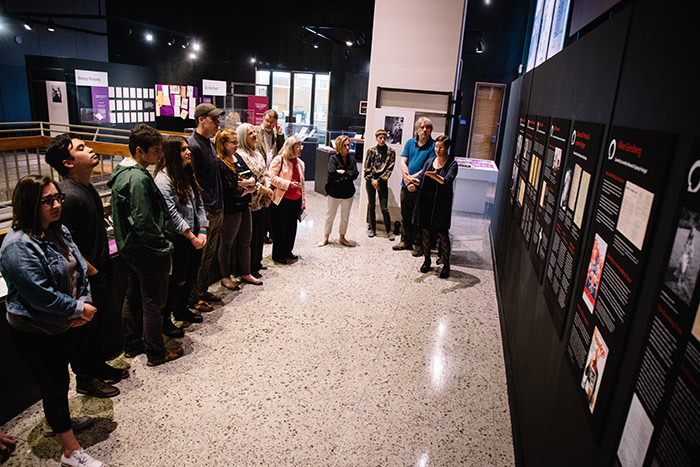 That research yielded broadsides, posters, poems in folders, haiku and snippets of poetry, newspaper clippings and even two exquisite artist books, all of which the students curated for the posters. Cassidy Schwartz and Hae-Kwang Woo curated a poster on Beat poet Gary Snyder. The project took tenacity, Schwartz noted. “We didn’t find that much [about Snyder] at first,” she noted. But then they discovered a collection of broadsides and “found a wealth of beautiful and brilliant poems printed on parchment and accompanied by beautiful illustrations.” Woo described the archival experience as a “fascinating view into the poet’s process of creating poetry,” noting that it was interesting to learn how to use the library for research for new material. 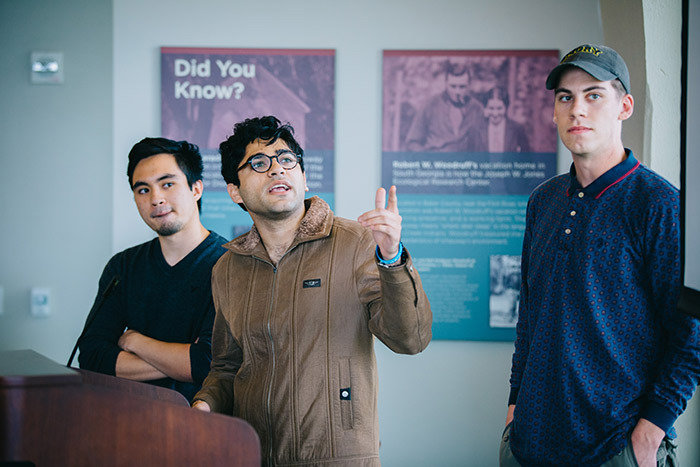 Kino Maravillas, Karan Malhotra and Taylor Mehalko had the opposite experience from Schwartz and Woo in the Rose’s abundant material on writer Jack Kerouac. “The problem was sifting through it and finding what we really wanted to include,” said Maravillas. They decided on a photograph of Kerouac’s desk and a rather large cross related to his Catholicism. The three also found in the archives several unpublished Haiku poems by Kerouac, and included those, too. Sonia Ghura, Ava Shaevel and Amanda Obando curated a poster on poet Anne Waldman. “We started our process by requesting something like 20 different items, literally everything we could find on [Waldman] in the archives,” Ghura said. Shaevel noted that they were able to find poetry, letters and newspaper clippings for a mix of interesting Buddhist-inflected material for their poster. Through a letter found there, “we really got a snippet of who she is and her passion,” Shaevel said. Ghura also said they found a beautiful artist book by Waldman entitled Extinction Aria that is very rare. “There are perhaps only 15 copies and the Rose has one of them,” she said. 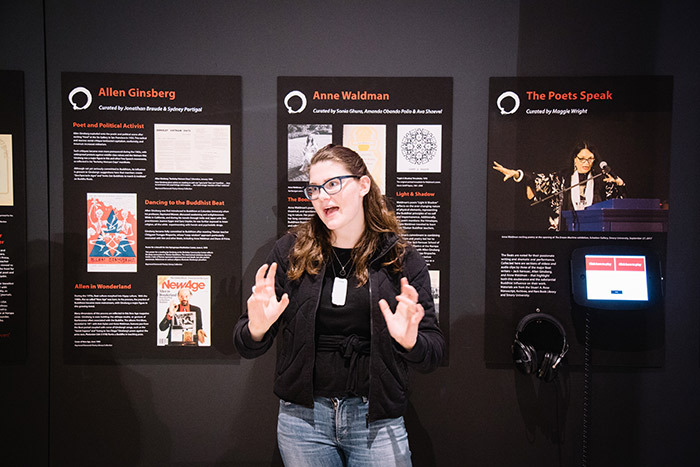 Maggie Wright created a kiosk using audio-visual materials from the Rose that feature Ginsberg, Waldman and Kerouac. 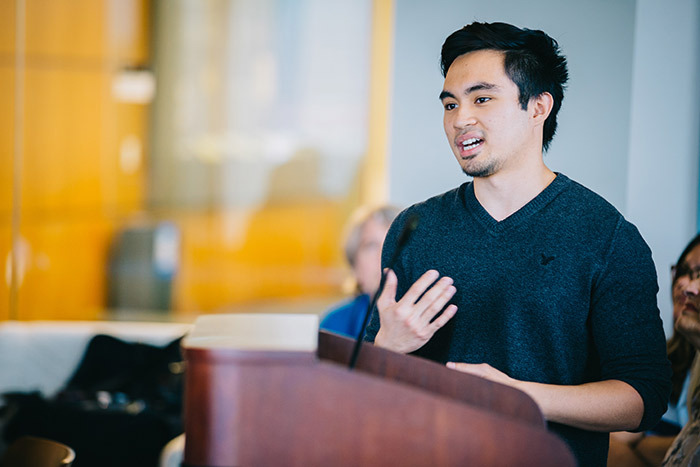 Included was a piece recited by Waldman during the opening of “The Dream Machine” exhibition called “When Chenrezig Walks Among Us,” about His Holiness the Dalai Lama, who is Emory’s Distinguished Presidential Professor. Her AV poster, entitled “The Poets Speak,” truly brought the entire pop-up exhibit alive. 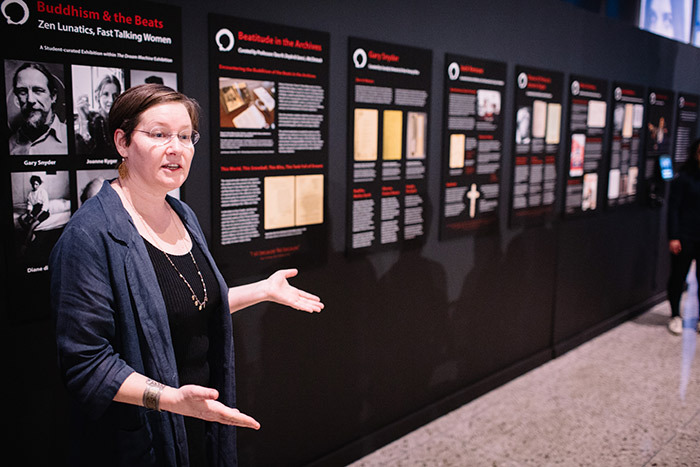 Doyle, senior lecturer in religion, and McClintock, associate professor of religion, decided to make archival research a focus of their class after attending a reception at the Rose Library in 2017, where a presentation showed a layout of the Schatten Gallery as planned for “The Dream Machine” exhibition, which featured a number of items, including Kerouac’s backpack. 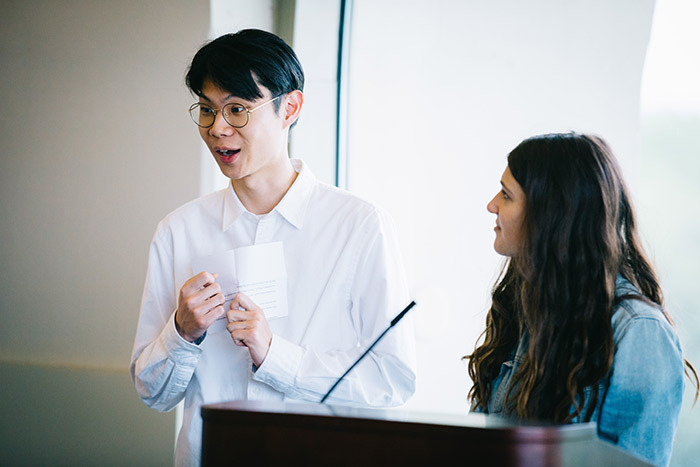 “Dream” curator Aaron Goldsman told faculty at the reception that there’s so much material available that for every piece marked for exhibition, there were 10 pieces that easily could have been put on display. 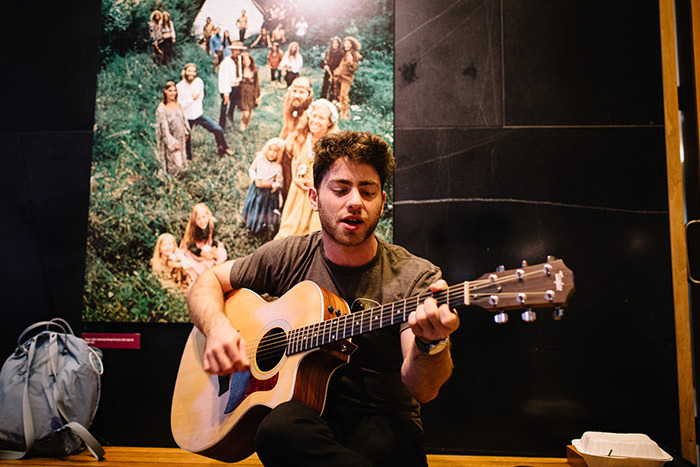 When Goldsman noted that the library encourages professors to bring students to the exhibit and into the archives to view even more of the materials, “Sara and I looked at each other and said almost in unison, ‘Let’s do a course on Buddhism and the Beats!’” Doyle recalled. McClintock and Doyle described their experience as a “communal enterprise with help from a lot of people from Rose Library,” including the design team, exhibition team and curators. They thank Christeene Alcosiba, public programming manager at the Rose; Maya Cody, Libraries Events manager at the Woodruff Library; Gabrielle Dudley, instruction archivist at the Rose, “our guru for the archives;” Gretchen Warner, senior graphics designer, Woodruff Library; Kathryn Dixson, exhibitions manager, Woodruff Library; Sarah Harsh and Aaron Goldsman, curators of “The Dream Machine” exhibition; and John Klingler, exhibitions preparator, Woodruff Library. Other supporters included Gary Laderman, chair of the Department of Religion and co-sponsor of the exhibit; Rosemary Magee, director emerita of the Rose Library; and Leslie Wingate, campus and community relations for Library and Information Technology Services.